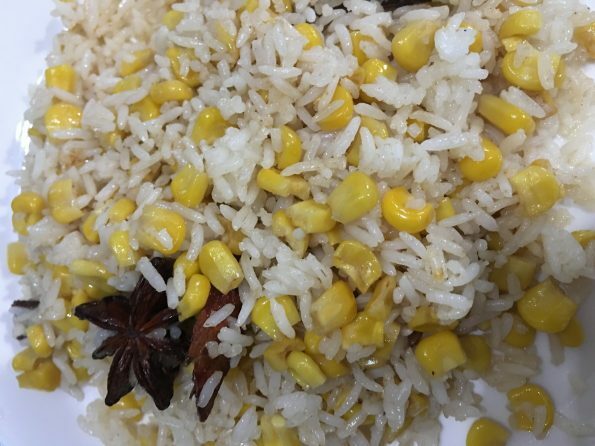 Sweet corn pulao recipe using leftover rice and frozen sweet corn kernels (or fresh corn) is so easy to make and it’s delicious and kid friendly rice dish too. I used leftover cooked ponni rice (variety of rice popular in South India). I used cooked raw ponni rice (not the boiled variety of ponni rice) but you may replace it with any cooked white rice that you may have at home. If you use fresh corn instead of frozen corn you can also pack this in lunchbox too. I used American sweet corn in this corn rice recipe, but you can use your favorite corn as you wish. This easy sweet corn pulao using corn and cooked rice is so quick to prepare and its yummy, healthy and kid friendly Indian rice, which you can easily pack in lunch box for kids or office lunch box for adults, or you can also pack this for travel etc. The addition of butter makes this rice very delicious, rich and flavorful, but if you prefer less butter, you can also use oil instead or you can totally reduce the amount of fat (use only as needed). Also you can use ghee instead of butter if you like the flavor of ghee, but I would recommend using less amount of ghee (about 2 or 3 tablespoons) since using too much ghee might change the flavor of the rice. 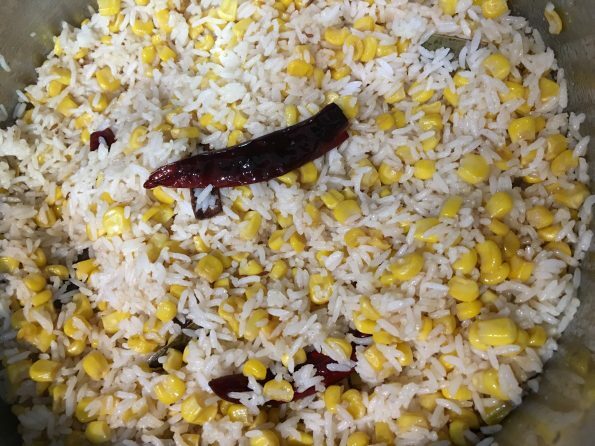 In this corn pulao recipe I used frozen corn kernels and cooked white ponni raw rice (South Indian rice). You can use any kind of cooked white rice like white basmati rice, jasmine rice or any rice as you like. So here is how you can quickly make sweet corn pulao using leftover white rice. Whatever variety of cooked white rice you use, make sure the rice is not overcooked, mushy or soft, but the rice grains should be separate and cooked just enough for the best texture and taste. This easy and yummy sweet corn pulao is made using frozen corn kernels, but you can use fresh corn as well. I used leftover cooked ponni rice,but you can use any cooked white rice as you like. Heat the butter in a pan and as the butter is melted, add the whole spices and lightly fry. Add the green chilies, onion powder and garlic powder, saute for few more seconds. Add the corn and enough salt, mix well and stir fry for about 3 to 4 minutes or until the corn is cooked and soft. Add the cooked rice and enough salt, stir, saute for about a minute and cook the contents for another 2 minutes in low heat. Serve the easy and delicious corn pulao using leftover cooked rice as it is or with any sides as you like! 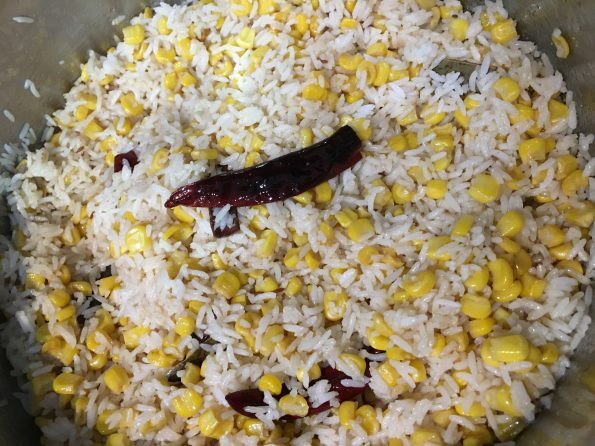 You can use froze corn (like I used here) or fresh corn in the recipe to make easy, quick and delicious pulao. Also feel free to use your favorite white rice for the recipe or whatever cooked white rice that you have. However the cooked white rice that you use use shouldn't be soft and mushy (as you would need for khichdi or sushi) but rather it should be cooked just enough and the grains should be separate for the best results. If you do not want to use short grain rice, the best rice I recommend for pulao is long grain white basmati rice which will go great in pulao, biryani etc. 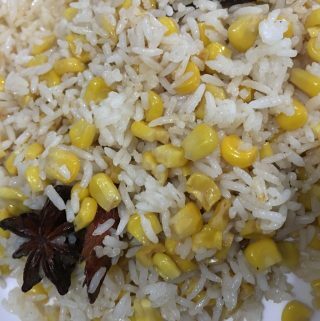 Hope you found this post on easy corn pulao recipe using leftover rice helpful in making quick, easy and delicious pulao rice.